What is Saint Bernard the patron of? Who or what is Saint Bernard the patron saint of? Saint Bernard is the patron of the Alps and mountaineers. Meanings, definition and origins - a patron is considered to be a defender of a specific group of people or of a nation. There is a patron for virtually every cause, profession or special interest. Prayers are considered more likely to be answered by asking a patron for intercession on their behalf. The story and history of Saint Bernard. Bernard was born at the castle of Fontaines, in Burgundy. The extent of his intellect filled his parents with the highest hopes but he renounced a life of wealth and joined the monks at Citeaux. He was appointed abbot of Clairvaux. 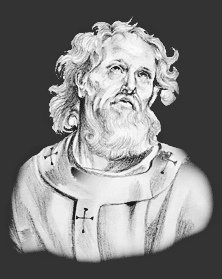 Bishops, kings, and popes applied to him for advice and he was charged to preach the Second crusade. Bernard kindled the enthusiasm of Christendom and the crusades and two great armies were despatched against the infidels in the Holy Land. There are two categories of saints: martyrs and confessors. A Christian martyr is regarded as one who is put to death for his Christian faith or convictions. Confessors are people who died natural deaths. Date of Death: Saint Bernard died in 1153. Cause of Death: Natural causes. Why is Saint Bernard the patron of the Alps and mountaineers? It is helpful to be able to recognise Saint Bernard in paintings, stained glass windows, illuminated manuscripts, architecture and other forms of Christian art. The artistic representations reflect the life or death of saints, or an aspect of life with which the person is most closely associated. Saint Bernard is represented in Christian Art with a demon fettered to his feet, or to a rock beside him, in token of his success in putting down heresy, and writing materials, in allusion to his homilies in praise of the Virgin. The Feast Day of Saint Bernard is August 20th. The origin of Feast Days: most saints have specially designated feast days and are associated with a specific day of the year and these are referred to as the saint's feast day. The feast days first arose from the very early Christian custom of the annual commemoration of martyrs on the dates of their deaths at the same time celebrating their birth into heaven.